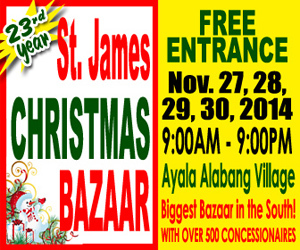 It is the biggest bazaar in the South of Manila with more than 500 concessionaires. The variety of products to choose from is so enormous that one’s Christmas shopping list will surely be filled up. This annual extravaganza is transformed into a virtual Shoppers Paradise for all discriminating shoppers. Products range from holiday foods for gift giving, Christmas decors, beautifully crafted home decor, wrought iron, native and imported bags, toys, shoes, Filipino ethnic products & handicrafts, Christmas packaging and wrappers, decorative candles, paintings, silver jewelry, over-runs of men’s ladies and children’s clothes, accessories, sculptures, and many more.